The rugged LS3408FZ, LS3408 Series handheld scanner from Symbol delivers superior fuzzy logic performance and versatility for scan-intensive industrial applications. In the yard, warehouse, distribution center, manufacturing or retail store, the LS3408FZ, LS3408 Series offers best-in- performance, excellent reliability and user-friendly ergonomics more productive mobile environment. Multiple interfaces ensure flexible plug and play host connectivity. 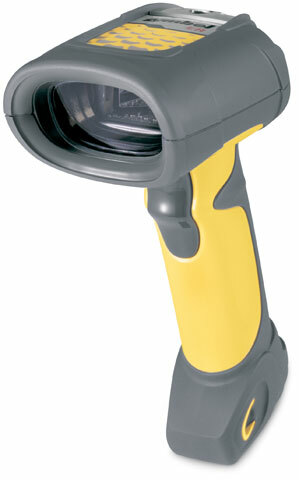 These rugged LS3408FZ, LS3408 Series scanners have a 6.5 ft. drop rating and are sealed to IP65 against rain and dust. The LS3408FZ, LS3408 Series delivers the best possible performance on damaged and poorly printed barcodes. Most scanners you see are in the safety of a retail or office environment, but behind the scenes, back in the warehouses and storerooms, the standard laser scanner would never hold up to the stresses of everyday use. This is where the LS3408FZ is a perfect match. Rugged enough to get run over by vehicles and even be used as a hammer, if you are in an outdoor environment or a warehouse-type application the LS3408FZ ensures you won’t be buying new scanners any time soon. The fuzzy logic scan engine on this unit excels at ready damaged or poorly printed barcodes. Where other scanners give up the LS3408FZ keeps working. For lighter applications you can always go with the reliable LS4208, but if you need a scanner that is as hard as you work, the LS3408FZ is up to the task.